Where do I use my RAC voucher code? Choose a code from us and copy it. Head over the RAC website and shop for you what want. Enter your vehicle’s details and model to get the products that are suited to your car. Add your items to your basket and once you’re finished shopping head to your bag by clicking the icon in the right-hand corner of the website. Login or enter your email and continue as a guest. At the bottom of the ‘Your details’ page, there’s a ‘Do you have a discount code?’ box. Paste your code into here and click ‘Apply Discount’ to enjoy savings on your order. "Free onward travel and key replacement with your cover." The RAC is a motoring organisation that was founded as far back as 1897 and now has over 8 million members. They offer breakdown cover with roadside assistance, vehicle insurance, help and advice when buying a used car, vehicle inspections and checks, legal services and up-to-the-minute traffic and travel information. Their online route planner helps you to find the quickest way from A to B and provides maps and directions for destinations in the UK, Europe and overseas, in fact, the RAC provides a solution for all of your motoring needs.They provide assistance to both private members and businesses. The RAC online shop offers everything that the motorist could need. They provide batteries for cars and motorcycles, breakdown kits, winter driving kits, European driving kits, car maintenance products, security products, cleaning products, sat navs, dash cams, mobile phone accessories, parking sensors and trackers, organisers and boot tidy and more. You will also find a selection of motoring gifts and gadgets and gifts for kids like for the kids like play tents, pedal cars and even a RAC patrol fancy dress costume. Please find contact details for RAC here. What member benefits do you offer? When you become a RAC member benefit you gain access to a huge array of benefits and incentives like discounts on days out, car parts, insurance and car services and even holidays. Find more information here. Do you offer business services? Yes. RAC provides business services for your car and van. As one of the UK's most progressive motoring organisation, you can rest assured quality service provided for both private and business motorist. Whether its breakdown cover with roadside assistance, insurance, buying a used car, vehicle inspections and checks, legal services or the most up to date travel and traffic information available, the RAC offers a solution for every motoring need. 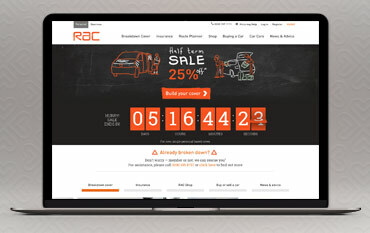 Shop now with a RAC discount code and save on motoring essentials.